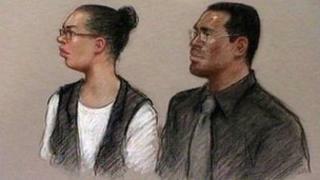 Two parents have been cleared at the Old Bailey of killing their four-month-old son, who was suffering from rickets. Chana Al-Alas, 19, and Rohan Wray, 22, from Islington, north London, denied murdering their child and causing or allowing his death. Jayden Wray died from a head injury in July 2009. A jury returned not guilty verdicts on the direction of the judge after prosecutors withdrew the charges. Experts had been unable to agree if the injury was caused by medical complications or trauma. The defence maintained the seizures and fractures were linked to rickets. Judge Stephen Kramer said: "The further and deeper one delves into the evidence, the more complex it becomes. "We could not have got to this stage without a proper investigation, examination and exploration of the evidence on all sides." The couple, who were 16 and 19 when Jayden was born, hugged and kissed when they learned their ordeal was over. The court heard Jayden died from brain damage and swelling but nearly 60 medical, professional and expert witnesses were unable to agree what the cause was. The prosecution said the brain damage could only have been caused by the trauma of Jayden having been shaken or his head having been hit against something. But the defence said it was only after Jayden died that it was discovered he had rickets owing to an undiagnosed vitamin D deficiency in his mother. This would have caused him to have weak bones, including a weak skull, and could have caused a series of fractures. The medical condition was also blamed for complications which led to his death. Sally O'Neill, defending, said Jayden was a much-loved and cared for baby and that his parents had been "pre-judged" by doctors and police. They had taken him to see doctors and to hospital when worried about his health but medical staff had not detected anything wrong with him. When Ms Al-Alas was asked if she or Mr Wray had shaken the baby or injured him, she said: "Never." Mr Wray told the jury he had been "very excited at the thought of being a parent" when he found out his girlfriend was pregnant. After the baby stopped taking his bottle in July 2009, they took him to hospital and he died after having seizures and being transferred to Great Ormond Street Hospital. Outside the court, Mr Al-Alas's solicitor Jenny Wiltshire said the pair "can now be allowed to grieve the tragic loss of their son who they loved and cherished".